When the Claude Moore Medical Education Building emerged from the construction rubble in 2010, it was apparent that the rules were changing. 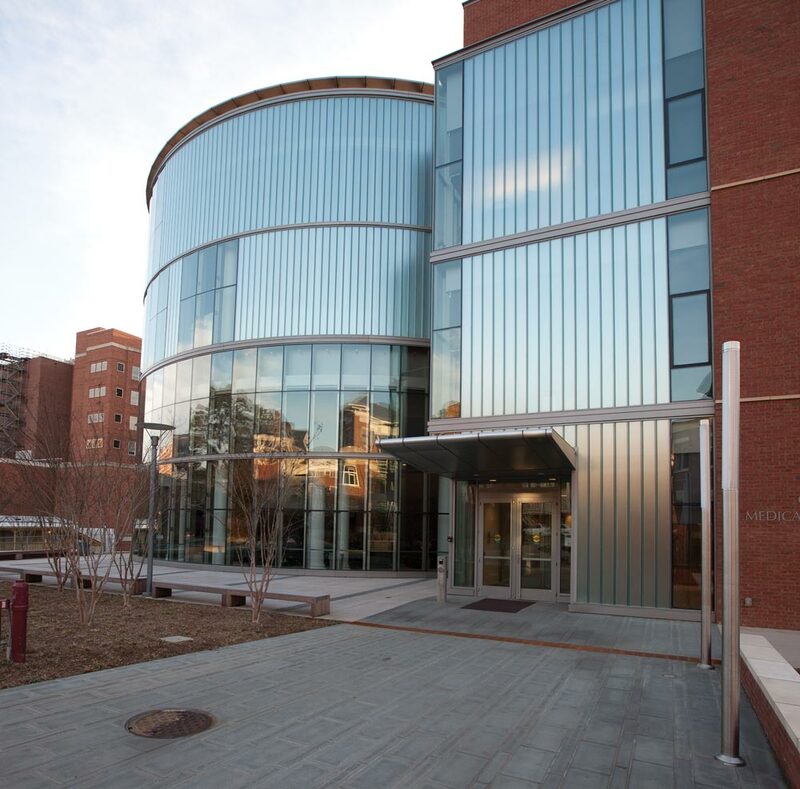 Set among all the square profiles and institutional red brick of the UVA Health System complex, its round structure of glinting glass looked, from the outside, less like a building than some futuristic beehive. It signifies a huge culture change within the School of Medicine. After the ritual white-coat ceremony at the start of the fall semester, the Class of 2014 entered a brave new world: They would be the first group to try a different curriculum, test the facility’s innovative educational technology and undergo a learning experience unlike that of previous generations. After four years, they are expected to graduate with the habits of mind—curiosity, skepticism, compassion, wonder—that will prepare them to be better physicians. 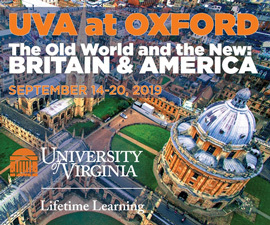 Like medical schools across the country, UVA has been undergoing a serious self-examination. Despite transformations in medical science and how it is practiced, the fundamental structure of medical education had not changed in a century. Most universities continue to follow a blueprint introduced in 1910, which called for two years of in-depth study of the basic sciences followed by two years of clinical experience. A cookie-cutter approach, it means that students spend two years sitting through long lectures and regurgitating facts on tests, followed by the shock treatment in their third year of suddenly dealing with patients in a hospital ward. About half of all medical knowledge becomes obsolete every five years. Every 15 years, the world’s body of scientific literature doubles. The pace of change has only accelerated. A study last year by the Carnegie Foundation for the Advancement of Teaching criticized present-day medical education as “inflexible, excessively long and not learner-centered.” It called for a range of broad reforms aimed at improving the quality of physician training, including a better integration of formal knowledge and clinical experience and a learning process that is individualized, not one-size-fits-all. Within the School of Medicine, all of these pressures led to something of a perfect storm. As plans advanced for the new $40.7 million building—it was the only school at UVA without a dedicated teaching facility—it coalesced into an unusual, functionally innovative design, one built around a new pedagogy. Clearly, the prospect of a new approach was a draw for many students. The percentage of students who accepted offers of admission for fall 2010 set a record high. On this December morning, the low rumble of conversation in the “learning studio” gives an illusion that class hasn’t started; after all, there’s no sign of a professor at the lectern. In a 4,500-square-foot circular room, 155 first-year medical students sit at round tables arrayed with their laptops and fuel for the next few hours: insulated coffee mugs, bananas, Ziploc bags of homemade cookies. This week’s theme, “Tolerance and Immunization,” is part of a semester-long course in molecular and cellular medicine. Instead of separate classes in four or more different disciplines, the curriculum is synthesized, interweaving clinical issues with the basic sciences. In teams of eight, the students debate a patient case: Walt Z., a 55-year-old chemist, comes into your clinic complaining of intermittent chest pain. As his doctor, you’ve arranged for an exercise stress test. But Walt Z. is an informed consumer of health care, and he has lots of questions about the test’s accuracy in diagnosing blockage in coronary arteries. Five large media screens hanging throughout the room delineate his medical details and a series of multiple choice questions. The course leader, Denise Bonds, an associate professor in the Department of Public Health Services, appears at the center of the room to lead the next phase of the discussion. The room’s interactive technology allows her to link to students’ laptops; it also enables their work to be broadcast onto the big screens. Instead of a blackboard, she can use a document camera, which is like an overhead projector, allowing her to write or draw a diagram that will project on the screens. Absentees can view a podcast of the session. In this “flattened classroom,” as it’s been described, the traditional top-down educational approach is reconfigured and the responsibility for learning shifts to the student. Students at each table have reached a consensus on the case, maybe having done some research online. Bonds calls out “Survey says?” and a member at each table raises a laminated card with their answer (A, B, C or D). Bonds points to a table and its spokesperson takes the built-in mic to defend their answer. She then gives a short, focused lecture, which is followed by a discussion about the difference between a test’s sensitivity and its specificity and the questions that arise in determining what test for Walt Z. is most accurate. Medical simulation is another way of aiding retention—particularly when it’s orchestrated to be stressful. “You want the learner to be stressed enough to make this relevant and important to them, and to re-create the emotions that they are going to feel when they have to take care of a patient, especially in a crisis situation, without scaring them so much that they are disabled,” says Keith Littlewood, an associate professor of anesthesiology and co-director of UVA’s Medical Simulation Center. UVa Medical Center's Medical Simulation Center from UVA Magazine on Vimeo. 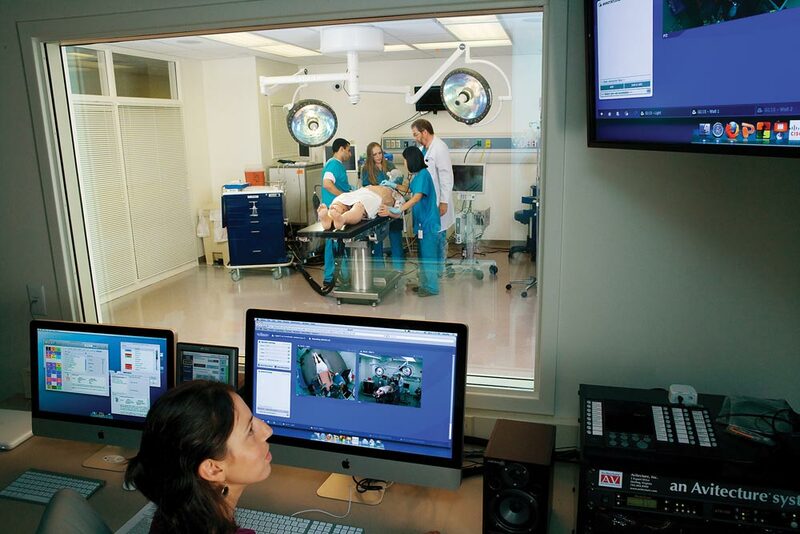 Simulation has emerged as essential to medical education and assessment. It creates a safe environment to make mistakes and think through what went wrong. It’s hugely popular with medical students, residents and clinicians alike. But until now, first-years have never experienced this component. Occupying an entire floor in the new building, the simulation center moved from a cramped 1,200-square-foot space in the Old Hospital to more than 10,000 square feet. Four large simulation rooms—an operating room, emergency room, intensive care unit and labor and delivery room—offer an array of realistic scenarios. There are also six procedure rooms for skills workshops, a faux emergency vehicle entrance at the building’s rear plus a triage area and decontamination bay. 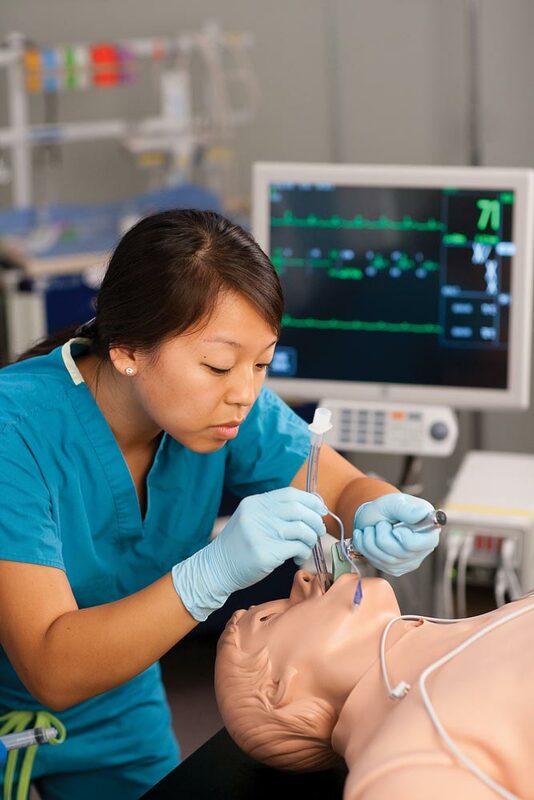 What makes UVA’s simulation center unique nationally is its primary focus on educating medical students. The school’s pride and joy might be the eight sophisticated patient simulators (six adult, two pediatric). Its high-end simulator, a $250,000 model, is a feat of engineering. It blinks, breathes and has a pulse. It can be put to sleep just like a person. Technologists on the other side of a one-way mirror manipulate its vital signs. Perhaps their most powerful tool is being able to assume the voice of the patient. Experienced clinicians who skeptically enter a simulation room—“walking in and seeing a big Ken doll on a stretcher,” Littlewood says—quickly suspend their disbelief when it suddenly moans and demands to know what’s going on. As impressive as the staging of a simulation is, the real educational impact occurs during debriefing. Five cameras positioned throughout the room have recorded everything, including the patient’s monitor information. Immediately following the exercise, students move to a separate room where, still highly energized, they watch the video and reflect on their decision making as physicians in that particular situation. When students see themselves on video, they have a much better understanding of who they are and what they appear to be. Sometimes there’s an uncomfortable disconnect between the two. On another floor of the new building, the Clinical Skills Center adds a human element. Here, students can refine their cognitive and psychomotor skills but also develop the talents for listening and communicating that will serve them well as physicians. The school has trained about 150 actors to simulate a variety of symptoms and diseases, all drawn from actual cases. Students interview these “standardized patients,” take their medical histories and examine them in 16 outpatient and four inpatient procedure rooms. At computer work spaces outside the rooms, the students chart their evaluations. As culturally diverse as patient populations tend to be, the actors provide immediate feedback, assessing not only diagnostic ability but also “bedside manner.” Unlike their predecessors, this class will practice such skills earlier and more often. Concepts like “active learning” don’t sound new because they aren’t—except perhaps in the first phase of medical education. The traditional structure of medical education is undergoing a transformation from internal and external pressures alike. Old paradigms are giving way to fresher approaches. By the standards of Bloom’s Taxonomy, a hierarchical classification system that formulates six levels of cognitive skills, the first two years of traditional medical education has been stuck near the bottom, according to Pollart. Knowledge of basic facts occupies the lowest rung; then the rungs move up through comprehension, application, analysis and synthesis to creation at the top. Faculty have always informed the next generation in the same way that they were: the time-honored didactic manner. With so many advanced tools in the new facility, however, they now have the opportunity to change the game. First, some uncomfortable truths. 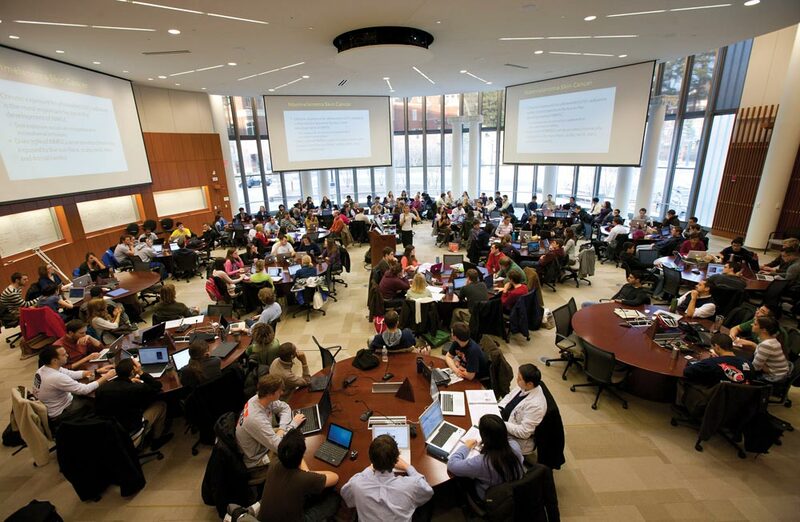 Lectures have largely become outmoded; at most medical schools, they are no longer mandatory and reportedly less than 50 percent of students attend them. Some studies indicate that students can master the same amount of content in a third less time using computer-assisted learning. Other studies in modern learning theory indicate that hour-long lectures are not the best way to teach students because the average attention span for listening to one is about 12 minutes. In late 2009, Pollart began organizing workshops that brought in consultants and educational experts to help faculty with the basics, like establishing learning objectives and outcomes in this newly integrated, interactive curriculum. A faculty journal club continues to meet biweekly to discuss topics relating to best practices in education. The circular learning studio, Pollart notes, is designed for learning, not teaching. Professors were unsure how to use it to their best advantage. There were awkward physical challenges. If the room has no front or rear, where do they stand? If they circulate among the tables, how do they change material on the screens? In the new space, they’ve practiced their movements like actors block a play. For that, the faculty may have the students to thank. In the learning studio, they clap at the end of every session. At the conclusion of the fall semester, they uncorked champagne (nonalcoholic) and presented flowers to their instructors. The fall semester was one long experiment. Faculty tried many new things, Canterbury says, and some approaches worked while others fell flat. There have been some technical bugs with the newly installed technology. Mostly, though, it went well and students were forgiving of the glitches. 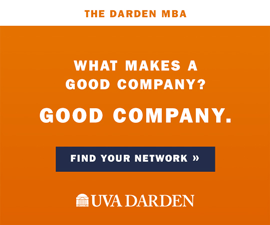 Jenkins says his friends attending medical school elsewhere “feel like they are showing up to a dark room for four to six hours a day, sitting through lectures and PowerPoint slides.” In contrast, he and his UVA classmates say they are more engaged and less stressed—a good barometer of the program’s success so far.